Hat clip slides on and easily attaches firmly to the brim of hat or visor. Ball marker features clear epoxy coating with UV protection for long-lasting durability. Magnetic ball marker can sit on top of the hat clip for easy reach during your golf game. 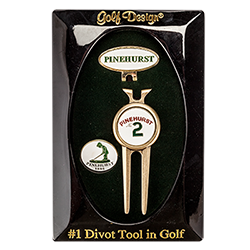 Includes Pinehurst logo divot tool.